In order to effectively design with D.C. motors, it is necessary to understand their characteristic curves. 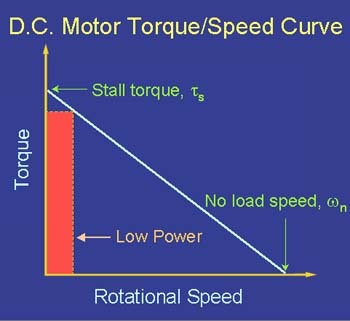 For every motor, there is a specific Torque/Speed curve and Power curve. The stall torque, , represents the point on the graph at which the torque is a maximum, but the shaft is not rotating. The no load speed, , is the maximum output speed of the motor (when no torque is applied to the output shaft). The linear model of a D.C. motor torque/speed curve is a very good approximation. The torque/speed curves shown below are actual curves for the green maxon motor (pictured at right) used by students in 2.007. One is a plot of empirical data, and the other was plotted mechanically using a device developed at MIT. 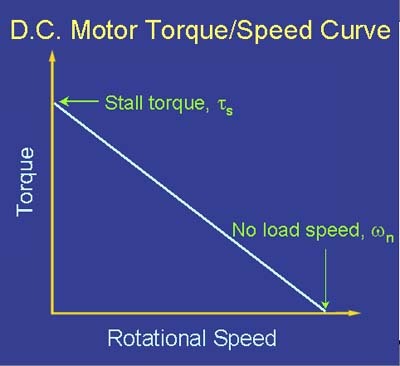 Note that the characteristic torque/speed curve for this motor is quite linear. 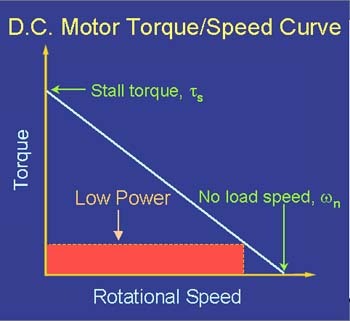 This is generally true as long as the curve represents the direct output of the motor, or a simple gear reduced output. If the specifications are given as two points, it is safe to assume a linear curve. Recall that earlier we defined power as the product of torque and angular velocity. This corresponds to the area of a rectangle under the torque/speed curve with one cornerat the origin and another corner at a point on the curve (see figures below). 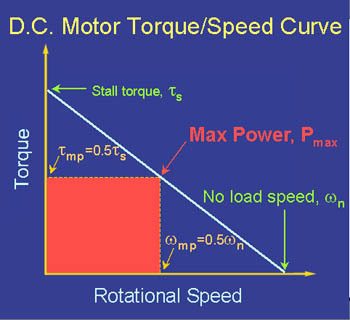 Due to the linear inverse relationship between torque and speed, the maximum power occurs at the point where = ½ , and = ½ . On every bulletin sheet there is sufficient data for you to plot the speed/torque and current/torque curves for each armature available in that particular motor size. Even though ratings are provided for each motor, seldom will you ever operate at that point. You really must draw at least a speed/torque curve to tell the speed at which the motor is going to run. Then, plotting the current/torque curve on the same graph will tell you the amperes required at your particular load point.